Defense Tech quotes and Army Times article that points to M-4 mods in the works Army wide. the civilian version of the HK-416 may NOT be crippled, that means it could be dropped into any M-4/M-16 style lower receiver. From a new rail system to a gas-piston upgrade and a round counter, I hope the Army follows through. This would put a better rile in soldiers hands while the Army awaits for that “new technology” that’s on the horizon. (Color me skeptical, but when it does arrive I’ll be the first to cheer it on). HK took a lot of flack for appearing to cave into the anti-gun lobby and modifying their HK-416 uppers to not work with any lower. The damn thing’s expensive enough as it is. If the rumor is true then black rile fans will P A R T Y! 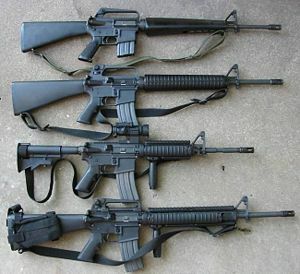 M-4, M-16 and other rifles Part II. The XM8 was poised to become the Army’s next rifle family. Viewed as the successor to the M16 line of weapons, the XM8 was close to being officially adopted in 2005. Gunmaker Heckler & Koch stood to earn hundreds of millions of dollars on a weapon that would be the premier rifle for all American soldiers for a generation or more. But the XM8 ignited conflict within the Army weapons community — a rift that acquisition experts say ultimately cost the service millions of dollars, with nothing to show for it. Acquisition heads at the Army and Defense Department levels also clashed over the XM8, which became the focus of an October 2005 DoD Inspector General audit. When the smoke cleared, the XM8 was dead, the general in charge of the program would retire and soldiers would continue to have to rely on the same weapons to fight a shooting war with no end in sight. Advanced Combat Rifle. Only the technology failed. The failed because it was too advanced. The technology was not there. Fueled by a requirement to best the M-16 by 50%, the gun makers tried. Epic fail. So why all the fuss over the M-16 and M-4? Meanwhile the layout of the weapon itself was also somewhat different. Previous designs generally placed the sights directly on the barrel, using a bend in the stock to align the sights at eye level while transferring the recoil down to the shoulder. This meant that the weapon tended to rise when fired making it very difficult to control during fully-automatic fire. The ArmaLite team used a solution previously used on weapons such as the German FG42 and Johnson light machine gun; they located the barrel in line with the stock, well below eye level, and raised the sights to eye level. The rear sight was built into a carrying handle over the receiver. The AR-10 was a very advanced design for its time. Despite being over 2 lb (0.9 kg) lighter than the competition, it offered significantly greater accuracy and recoil control. General Willard G. Wyman, commander of the U.S. Continental Army Command (CONARC) received a report about the new 5.56mm round. CONARC had the AR-10 re-designed to the 5.56 (or .233) AR-15. When Kennedy was elected to the Oval office, Robert McNamara (former Ford Motor Company exec) became secretary of defense. During a series of tests with some rifles (altered over Stoners objections), the M-16 had some catastrophic failures. After some engineering tests, the Army pressed for a larger round. However, mock combat exercises convinced some that the rifle had merit. Not all the reports were negative. In a series of mock-combat situations testing the AR-15, M14 and AK-47, the Army found that the AR-15’s small size and light weight allowed it to be brought to bear much more quickly, just as CONARC had suggested. Their final conclusion was that an 8-man team equipped with the AR-15 would have the same firepower as a current 11-man team armed with the M14. They also found that the AR-15, as tested, was more reliable than the M14, suffering fewer stoppages and jams in tests where thousands of rounds were fired. So McNamara had two conflicting reports, one where the Army wanted more M-14’s and another where it wanted the 5.56 AR-15. In truth, most in the pentagon wanted more M-14’s, even when the AR-15 passed, army officials rejected it in favor of the M-14. Yet Stoner persisted. His first boss Fairchild Aircraft sold their Armalite division to Colt. Colt and Gen. Curtis LeMay closed a deal for M-16s to the air force. Their security forces would use the rifle. 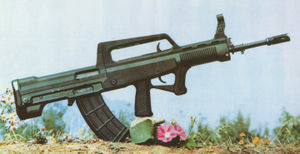 Colt inked a deal with the Advanced Research Projects Agency (ARPA), who bought 1,000 rifles for South Vietnamese forces. Utilmately, McNamara would ram the M-16 down the Army’s throat. However Colt introduced a number of cost cutting measures. The bore and chamber were not chrome lined (causing corrosion). A forward assisted was not added (despite reports that the weapon had trouble operating when dirty) and the power was changed. See, Colt somehow convinced the Army that the rifle was “self cleaning”. This would be a bone of contention and the source of many urban legends about the M-16. To make this short, the rifle has redesigned. Newer models had chromed bores and chambers. A forward assist was added. Numerous other improvements were made. In many Vietnam war movies, the rifles have this distinctive burrrp. Newer models redesigned the end of the barrel (the flash suppressor) from the 3-prong to the bird cage. Most modern M-16s sound just like any other rifle. The full auto mode was discontinued. Soldiers just waste ammo. instead the rifles have a three round bust (in addition to fire and safe). Thus the M-16 became the M-16A1, then M-16A2. The full auto variant is the M-16A3. The M-16A4 has rails and is modular taking many aftermarket scopes and accessories. So once again why all the fuss? 15% reported that they had trouble zeroing the M68 reflex sight. 89% of soldiers reported confidence in the weapon. In the fall of 2007, the Army tested the M4 against three other carbines in “sandstorm conditions” at Aberdeen Proving Ground, Maryland: the Heckler & Koch XM8 rifle, FNH USA’s SOF Combat Assault Rifle (SCAR) and the Heckler & Koch HK416. Ten of each type of rifle were used to fire 6,000 rounds each, for a total of 60,000 rounds per rifle type. The M4 suffered far more stoppages than its competitors: 882 stoppages, 19 requiring an armorer to fix. The XM8 had the fewest stoppages, 116 minor stoppages and 11 major ones, followed by the FN SCAR with 226 stoppages and the HK416 with 233. The Army now has plans to improve the M4 with a new cold-hammer-forged barrel to give longer life and more reliable magazines to reduce the stoppages. Magazine failures caused 239 of the M4’s 882 failures. Army officials said the new magazines could be combat-ready by spring if testing goes well. So the Army is at a quandary… replace the black rifle with another one, possibly re-training the entire army, use a modified M-16/M-4 type rifle and stick it to Colt or keep on keeping on. 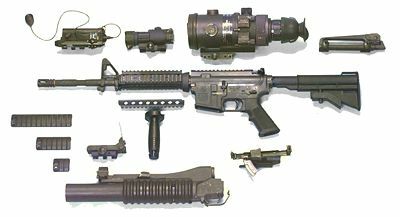 M-4, M-16 and other rifles Part I. “God made man, Colt made him equal” famous quote about Colt firearms. However much ink has been spilled, many electrons have been murdered to make the case against the M-4 and M-16 (plus the 5.56). But let’s stop there for now. Penetration: the 5.56 gets kicked around a lot because of it’s supposed “pipsqueak” diameter. Yes its small but it has a high velocity. The 5.56x45mm NATO cartridge with the standard military ball bullet (NATO: SS109; U.S.: M855) will penetrate approximately 15 to 20 inches (38 to 50 cm) into soft tissue in ideal circumstances. As with all spitzer shaped projectiles it is prone to yaw in soft tissue. However, at impact velocities above roughly 2,700 ft/s (820 m/s), it may yaw and then fragment at the cannelure (the groove around the cylinder of the bullet). These fragments can disperse through flesh and bone, inflicting additional internal injuries. Fragmentation, if and when it occurs, seems to impart much greater damage to tissue than bullet dimensions and velocities would suggest. This fragmentation effect is highly dependent on velocity, and therefore barrel length: short-barreled rifles generate less muzzle velocity and therefore rounds lose effectiveness at much shorter ranges than longer-barreled rifles. Hague Conventions of 1899 banned “bullets that easily expand or flatten in the body”. So the 5.56mm was created as a workaround. It ricochets when it hits anything solid. Like trees, rocks, or bone. My Drill Sgt at For Jackson related the following: During a life fire exercise a soldier had his weapon pointed at the ground. He was at the low-ready position (weapon in hand, buttstock on chest weapon pointed down) but his weapon was not on safe. His finger was not supposed to be on the trigger but it was. He accidentally shot at the ground. The bullet ricocheted off the ground, a tree and a log to wizz past the Drill Sgt’s head. He told us this so that we would respect the weapon and the bullets it fired. Small caliber, low recoil, good penetration. That is the 5.56mm. However due to the M-4 (14 inches) having a shorter barrel than the M-16 (20 inches) muzzle velocity is lost. When that goes down penetration goes with it. Regarding terminal performance, there is no doubt the M855 ball round is quite lethal out of the M4 carbine. However, many of the 3-7th Cav’s veteran NCOs with heavy combat experience in Iraq wished it packed more punch. Fighting room to room, engagement distances are up close. In such an environment, where the insurgents they face may be doped up on narcotics, they wanted a threat to drop instantly–not stay on his feet for a couple seconds still capable of triggering off another burst. In the Special interest mag “Book Of the AR-15” (out now), Mr. Fortier raises a good argument against replacing the M-4. We are at war in Iraq and Afghanistan. Replacing rifles and ammo during a confilct would be a mistake. Sure there is the 6.8mm SPC or the 6.5 Grendel. But you have to mass produce the rifles and bullets. During the Cold War, having the 7.62 M-60 machine gun and 5.56 M-16’s was a nightmare, logistically. With National Guard and Reserve units, bringing in a new caliber would be a worse nightmare. However, arguments can be made about replacing the rifle itself. It looks like the Army just might be serious about replacing the M-4. And this time all eyes are on the Army to see what they pick.